Most travelers prefer to stay over in a bed & breakfast because these types overnight accommodations usually provide travelers with better service and the accommodations itself is usually quite interesting. Hotel rooms are often dull, cold and usually contain the same white linen and watered down room décor. Bed and breakfasts, on the other hand, strive to entertain their guests by creating rooms with a warm atmosphere, a unique vibe, and an inviting overall look. Visiting a bed and breakfast is almost like taking on an amazing adventure because staying a night in a beautiful and personally decorated room certainly is quite an experience. At Hines Mansion, we do our best to be one of those bed and breakfasts that go above and beyond when it comes to creating a unique experience for our customers. Each of our guestrooms is personally designed to be completely unique and completely different from any other overnight accommodation you have ever stayed over at before. The Eagle’s Nest is located on the highest floor of Hinges Mansion and is the largest room in the building. This beautiful room features 8-foot oval windows with a breathtaking view and the interior decorating is incredibly patriotic. A vintage American theme is used within the bedroom complete with patriotic flag, matching room decorations and a luxurious king-sized bed with unique quilted bedding. Kitty Hines was the original hostess of the bed and breakfast and the room was named after her. This room consists of classic shades of blue and with a light and clean vibe. Our Kitty Hines suite is one of our most elegant rooms, boasting turn-of-the-century French stylings, with the shades of blue along with the beautiful décor designed to promote relaxation while you are staying over in this cozy little room. Aptly named for its library-esque décor, this suite transports you to the Victorian era. Part of its allure is a spiral staircase with a relaxing sky-lit bathtub at the top where you can relax in our two-person jetted tub and enjoy the stars. Our seaside retreat suite is dressed with a traditional nautical theme with several ship and sea related artwork and designs that make you feel like you’re on vacation at a beach house! The blue hues of this suite will whisk you away to thoughts of a cool ocean breeze, and the stained glass window will dazzle you with colors reminiscent of a summer long past. The Secret Garden room has a floral design and is a fantastic room if you love an open plan room. There are no dividers between the bed and bathtub which creates promotes the feeling of friendliness and openness. Inspired by Butch Cassidy, the Lodge is a rustic western-themed suite that will transport you to a cabin in the woods where you can find rest in the king-sized pine four-post bed and enjoy the large two-person jetted tub as well as a private bathroom. The Lodge is a comfortable, rustic home away from home and is undoubtedly the most popular room at the mansion.. The epitome of Victorian style, the Victorian Rose embodies the getaway experience. A stay here can provide an immersive experience. Accented with period-era floral wallpaper and lace curtains, you can enjoy an elegant stay in this luxury suite in our comfortable queen bed and a two person jetted tub. As the name suggests, this suite is adorned with a theme reminiscent of nature. The green walls as well as the decorations can be likened to a room in a nice cozy cottage. Vibrant colors give you a breath of life, especially if your stay is in the dead of winter. If snug and cozy are what you’re looking for, our Winter Dreams suite is perfect for you. A stay in this beautiful room will blanket you in warm rich tones, hand-covered mahogany, and beautiful rustic decor. Let your worries drift away as enjoy a soak in our jetted tub, or sleep the night away in our comfortable queen four post bed. This romantic bedroom offers a sense of warmth and elegance. The room features several authentic features and is the ultimate bedroom to choose when you want to chase away the winter blues. Instead of spending your night in a cold and uniform hotel room you could be enjoying charm, warmth, and wonderment. 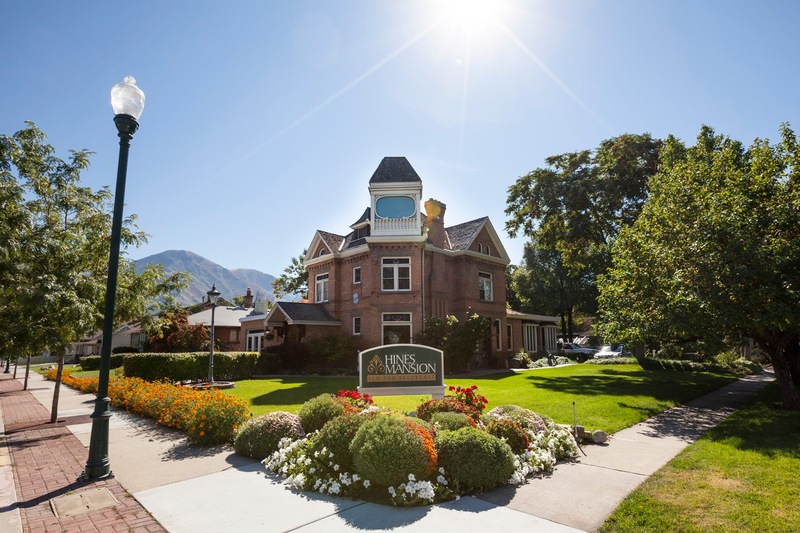 Choose Hines Mansion for your stay in Provo and enjoy the comfort, elegance, and amenities every time you come over to this lovely little mansion.